Street Church was undecided whether we should march at the end of the parade this year, like last year. But at the last minute the Calgary Police called Art, and told him, Street Church had an official spot in the parade. The police went to bat for Street Church to get us an official spot, even when the stampede board had denied us. There were 20-25 people from Street Church who marched the entire stampede parade, with a huge banner with the Name of Jesus leading the march, and the Ten Commandments at the end of the March, and Christian music was playing from a small hand held sound system. The response was similar to last year with many people cheering, singing, and standing. There is nothing like marching for Jesus in front of hundreds of thousands of people, you really feel like an ambassador of Christ. Last night at Friday night evangelism the police showed up due to a complaint of noise violation, but when they showed up they realized that the violation was not valid, because Street Church had not even plugged in the sound system yet. 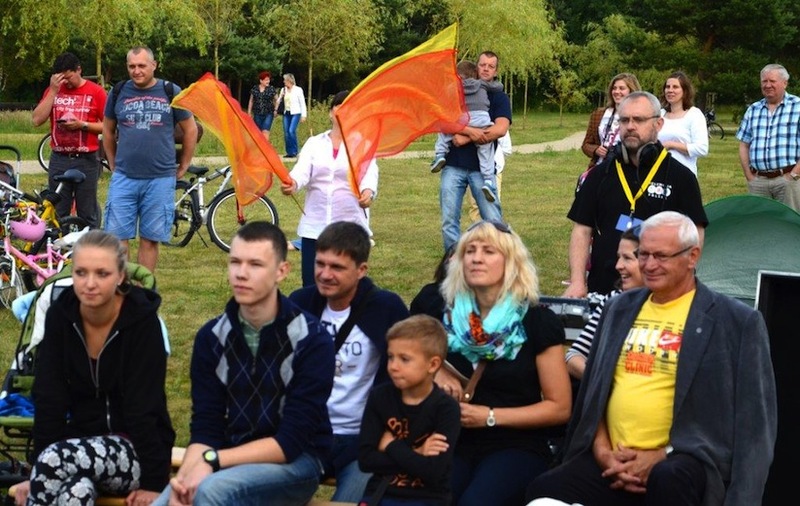 They talked with Bogden and told him they are realizing that many of the accusations against the ministry are lies, and they are for us, because even if the ministry takes one person off the streets with the message of Christ, it is one less person they need to deal with. We praise God, for only He can give such favor. It is God who opens eyes that they can see, and ears that they can hear. God has given us favor with certain police officers at this time, and we give Him all of the praise. He is our deliverer and our strength. Last night we sent a small team of 3 to the stampede grounds right outside the gate to share the gospel one on one. God opened up huge doors to talk to people about their souls, especially amongst the young people. The first group we ran into by the river, were all around 20, and they were drinking, we started with small talk then handed them all gospel tracks, after this the conversations started, and we ended up finding out 5 out of the 7 went to Christian schools, and 2 were backslidden Mormons. By the end of the half hour of talking, Cody wanted to rededicate his life, and hand out tracts. A girl who thought she was saved, was convicted to tears and wanted to know how she could be saved, the Mormons were impacted. And the other three called us Bible thumpers and laughed. Praise God. There were many other one on one conversations God opened up in the 3 hours of witnessing. Please pray for Hussein (Muslim), Chris, 2 young man, 2 young girls, Brad (whose best friend just received Christ, and he could not believe someone else was sharing the gospel with him), a gang of young natives, and all the people who received a gospel tract, and were talked to, please pray for their salvation. Whenever we leave a time of intentional witnessing, God fills us with such joy, even when we go down there with fear and hesitation, after witnessing is always such a blessing. If you have never tried I encourage you to go, you will not regret it. I encourage everyone to go down to the Stampede and share the good news, what an opportunity, thousands of souls just waiting to hear the gospel. No advertising needed, just find out where people hang and go out and be a light in the darkness, very simple. Pray and go! We as the body Christ need to look at the Stampede, Stampeder games, flames games, as opportunities to share Christ with thousands of lost souls who are headed to an eternity in the lake of fire. Just grab a couple Christians, some gospel tracts, pray and go. 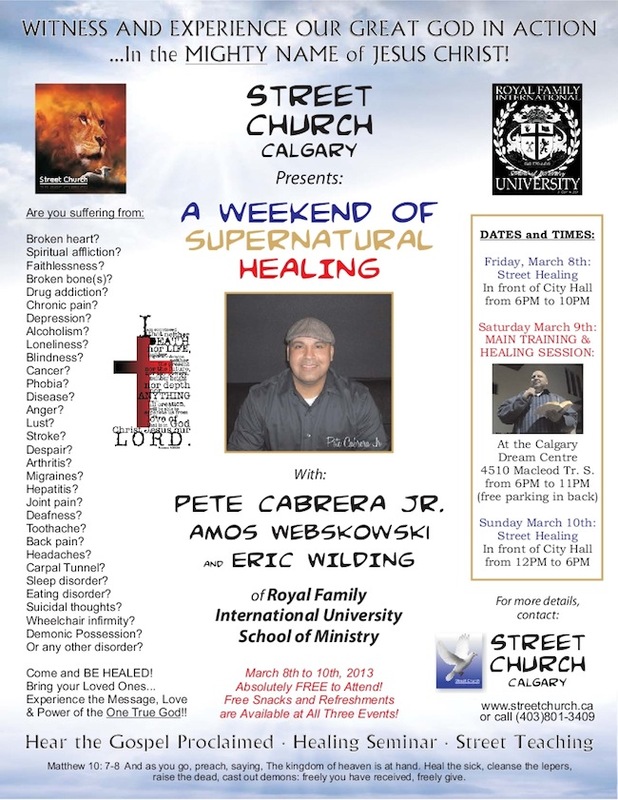 February 12, 2013 Artur Pawlowski Comments Off on A weekend of supernatural healing.